Our beloved beagle, Bootsie, was a profound source of inspiration for me to complete THE DAWN. On a sunny, warm day in early February 2011, at nearly 14 years of age, he had to leave us. I’d been at work in the midst of revising the scene where Arthur and Camille meet again in Chapter 52. And so the noble spirit of that soulful hound persists until the end of the novel. I would be remiss without mentioning the two abandoned cats that I adopted in the spring of 2008. They were victims of the sub-prime collapse; their owner left them when her house, adjacent to mine, was short-saled and she was evicted. My mostly Burmese black cat, Annabella, quite easily took the form of Gisele in THE DAWN. 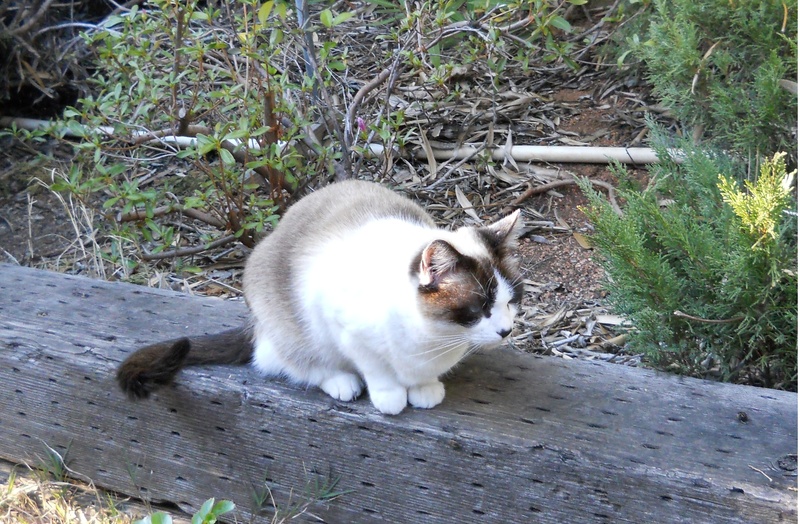 And Gabrielle is the Snowshoe who became Penelope in NOCTURNE. 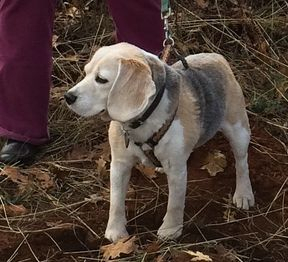 My 13-inch beagle, Bridget, has not yet been fictionalized, but she is a second cousin of the famous Uno and Miss P, and so that claim to fame will have to suffice for a while. 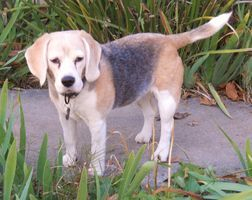 There was also our first beagle, Bonnie. 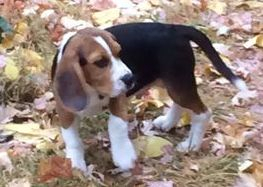 Bootsie, the second beagle, was the triumph of hope over experience. Our veterinarian for Bonnie once had to spend a night of observation with this willful hound. She then told me that she’d never met a more obnoxious dog in all her years of practice and she sternly requested that I never bring her back for overnight care for gastroenteritis. When Bonnie died, this vet kindly assured me that this hound had been a loving pet, and I had to confess that she really wasn’t. Nevertheless, the young Bonnie, who somehow survived to the ripe age of 12, willfully found her way into the creation of Little Dell in NORTHSTAR; and later of Chiot in THE DAWN. 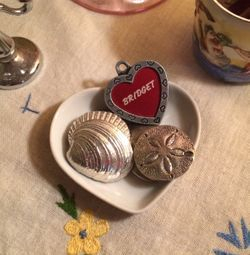 On 22 August 2015, our beagle Bridget journeyed to the other side where she joined her Hero, Bootsie, and – who knows – perhaps even Bonnie! 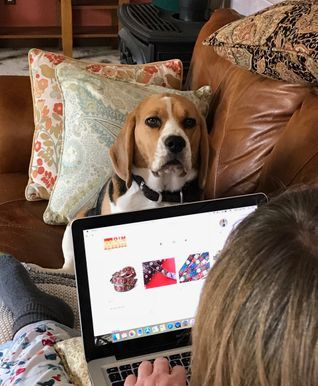 I’ve no doubt that the lovely Bridget let the first beagle know just who is really #1. We welcomed home Chance Beaumont Milligan on 14 October 2016, a rain-soaked Friday in northern California. Born on 2 July 2016, my Lucky Charm is quite a little guy!! 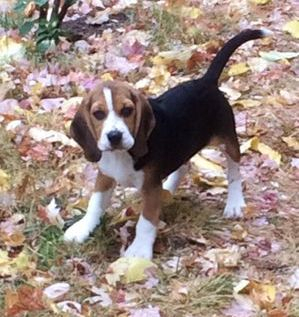 We are still early days in the knowing of our new beagle but little Chance is a Lanbur and already he promises to live up to his bloodline. It will be a wonderful walk in the park with this sweet, adorable, intelligent, playful, sensitive, curious, adventuresome and affectionate Chance, our Lucky Chance! And he is quite the canine communicator: he talks not only with his big, soft, pleading eyes but with his big soft puppy paws, alluringly touching you! Want to come pet me . . . ? Rub my pink spotted belly . . . ? Maybe play with the stuffed sock . . . ? Even before Mr. Chance arrived by my side to assist in editorial emotional support, I discovered the little guy was already working right along beside me! The various websites that I use during my work and down-time featured sponsored ads with photos of our future pup from the doggie placement service online where we decided to take a chance. And he’s a rare chance at puppy love! For anyone in the U.S. interested in this wonderful organization, here is the link to this private breeder network which places their babies only with caring families. 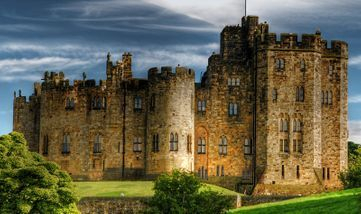 We are thrilled at the chance to offer a chance to anyone else willing to take a chance to find his or her Lucky Chance! How are the cats getting along with Chance, the wonder beagle? They’re all a wonder to behold each day! The cats certainly love his dog bed or, rather, the pet bed that became their newest cat bed. Chance has a tendency to devour any bed bought for him. He is what has been described as a “tenacious chewer” and so we have decided to forego purchasing the bed that can be chewed but not destroyed whilst he lays upon it. We grant him the option of any couch, chair or horizontal surface that he wants. There is a lot of Boostie in him! As usual, the cats claim the front half of the property and the hound claims the back half, although I have seen the classic daring (“chase-me”) pose that Gabrielle strikes in front of the gate that divides the felines from the canine. It is always amusing to watch her go from demure to provocative in the space of 12 seconds. As for Annabella, whilst maintaining her calm Cleopatra pose, she keeps an EYE on this busy beagle who barks but has proven that he has better things to chew — like one of my favorite handmade placemats! I am sure it is the handmade quality that attracts him to the cotton. He is a natural fiber lover! The cats reign supreme in their tiny terraced parterre of flowers. I still must chase away the occasional intruder cat. Chance has yet to become trained in the art of chasing cats we do not want on the grounds but cozying up to the cats who were here first — the cats we want and love! Happy Easter to all cat and dog lovers! 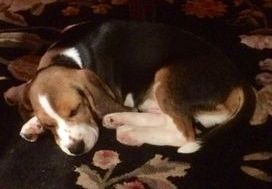 When we first brought Chance home, we knew that this beagle had some very large paws to fill, although his paws are quite humongous. Since his birthdate is July 2, he almost shares that special day of birth with his esteemed, beloved and dearly departed predecessor, Bootsie, who was born on July 3. From those wide open romping fields in the sky, the old Liberty Dog is showing the young Liberty Dog how to live fully, with a spirit of independence, second to none! So, on this day, we all salute you, Chance: Happy Birthday! Chance is a full-grown dog now. He obeys! 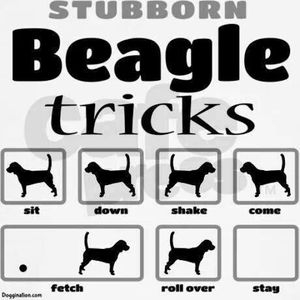 This behavior is not typical of any beagle. Here is a breed whom one must convince that, first, listening to a command is in the dog’s best interest. And then, actually obeying the order, that response would be good for all concerned. The greater good, in fact, is what must guide the spirit of this independent-minded hound. I believe the obedience from my Puppy Love is part of his birthday gift to me. Obedience and love: they do not always coincide! 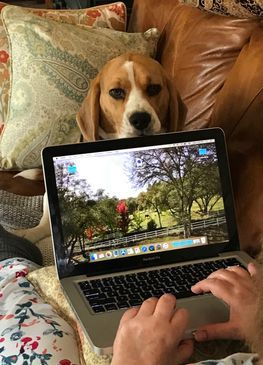 Hunger and this beagle also do not always coincide, a circumstance that I can tell you, from decades of dogged doggie experience, is not normal. Every night, and it is rather late for dinner, toward nine, the Master has to encourage this hound to eat his chicken-and-rice kibble. First he gives Chance a few nibbles which are eaten somewhat gingerly. Chance has to warm up to the meal! Perhaps because it’s not one of our meals? I am not about to find out by crunching a bowl or two (his usual serving) of the canine food to grant him that deeply shared experience that he so hungers for! The 1-year-old Chance has developed his own routine: after an arduous 3-mile walk through the countryside with the Master each morning, he has his little Pyrex dish of morning tea with me and a couple bites of a Digestive (Diggy) Biscuit. He then jumps atop the soldier-blue flannel sheet on the sofa of his choice (Chance likes options). I will then start to work at my laptop after slipping into the Bose a CD of some Classical Music. Chance favors Chopin, but he will accept the strains of violins from Bach or Schubert, as well as a repertoire of romantic themes, quiet moods to suit his quiet mood. Chance Beaumont is a cultured hound! Once the soft music has begun, Chance hops from, usually, the parlor sofa to the leather chair where he re-arranges with those big puppy paws a blanket and two pillows for himself. He then naps for about two hours! Anytime that Chance is not sleeping, he is . . . playing! The melted water drools from the dog gaskets that are always overflowing, and I tell him, “No.” He accepts the limitation. He’s a highly unusual beagle, with unusually large flews. 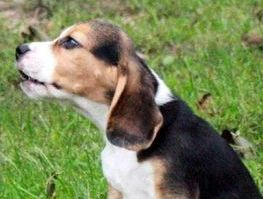 Most beagles are quite flew-sy, but this one is flewsier than most! In the late afternoon, Chancey Boy likes to fetch some z’s in his personalized dog bed, by his basket of toys, in the sunroom. During that hour, which is far from blue, he prefers Spanish guitar music by Segovia and Julian Bream, although Rodrigo’s “Concierto de Aranjuez” lulls him right to sleep. 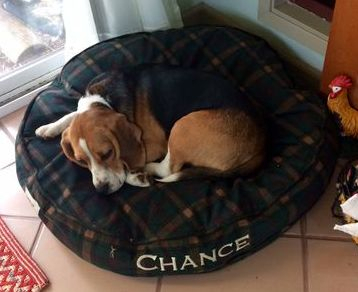 Chance did not really like to use his dog bed, until the thing got moved into the sunroom during some housecleaning. The dear sweet devoted Puppy Love needed his own room! I call it his Romper Room. Since Mr. Chance has his very own name stitched onto his bed, he must now learn to read! Do not pity him. I grade generously and fairly. 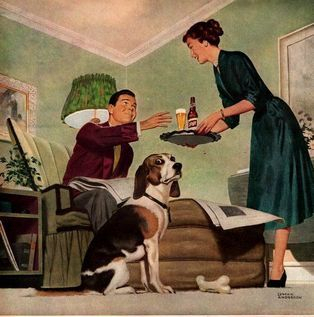 Every day when the Master arrives home, after a long day of labor mixed with leisure, I give Chance his grade. It now ranges from A to A++++. The days of C to F are gone! One rapid, poetic movement that this dog makes while he runs downhill is quite distinctive and elegant, like a gazelle. He is spring-loaded! Yes, Mr. Chance is a very handsome boy! Very strong! 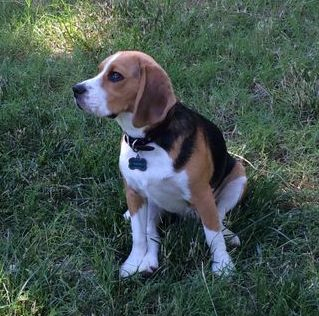 He is the James Bond of Beagles! 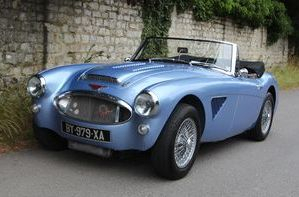 I envision him driving an Austin-Healey, perhaps to the beach, where he can build a castle much like Alnwick. Pail and shovel are in the back seat! We bought Chance a little plastic kiddie pool for the summer, the hard plastic kind, not the blow-up model because he would tear into it and chew it up. (Just this morning, though, I did catch him, on the patio, trying to carry off the emptied pool with his super-jaw. I put a large rock in the pool to weight it down; Chance found the rock un-chewable and left the scene!) This winner of a dog can now cool off during the hundred-degree heat waves and get some water. He has his own little Horsie Trough! He loves running through the sprinkler too during those triple-digit-days. This beagle does love his toys! He’s a pack-rat about them: he will not give up one toy, even after it has been nearly chewed out of existence and another one has been bought for him. Yes, with a tenacious chewer, the toys come and, once shredded, they (surreptitiously) go. The online company, Chewy, offers Auto-Delivery, but I am putting my foot down on that one. Speaking of feet, I have to say that my shoes, and feet, are perhaps his favorite chew toys among his mouth-mangled menagerie. Chance gnawed his way through 3 pairs of thongs and he does not understand why I do not give to him my new pair of Dr. Scholl’s to quietly gnaw. They are made of the same resin as his phoney-pretend antler! I bought a back-up pair, in red, just in case . . . My first thought now regarding any physical object is: I hope he doesn’t chew it. My second thought is: Where do I put it so that he will not chew it? Chance tends to . . . cling to things that he loves . . . like his Gekko squeaker toy, the pink-and-gray Spotted Cow flannel rattle (a replacement for the brown-and-orange flannel Owl of his puppyhood), an old pair of Chukka Boots, and, amazingly, a sock from many months ago that had once adorned my foot. From time to time, he drops it at my foot, a token of his love. There was also the leather work glove that he chewed out of recognition. He then would bring the thing to me and gently drop it at my feet, each night, at bedtime. The Love Glove, I called it. These gestures form a more gentle approach than when Chance first sees me emerge from the Home and I venture out, onto the grassy grounds. He bullet-dogs up the sloped hill to me with excitement, carrying his 4-foot long stick. Sounds like a Bond plot line! There are new garage doors to the “barn” that comprises our garage. The two wooden doors were relics from the early 1960s. The installation guy said it had been quite a while since he’d seen ones of that vintage. A by-gone era left us and we were quite enthused to enter the 21st century, at least garage-wise. The cats, however, were not enamored of these sliding metal wonders, complete with windows. The new exit route gave the felines more than a pause. 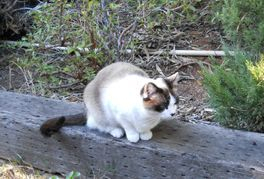 Gabrielle, the Snowshoe, flitted around the roomy garage for a day and then she realized — with wide open blue eyes! — that she could get a wonderful view of the panorama outside, just by sitting on the roof of the vintage truck parked on the left side of the garage. She also saw that she could flit out and in, in and out of the garage — underneath two horizontal door openings! The Snowshoe is a social-scene opportunist! Annabella, however, meowed for 4 days straight. Long, moanful sounds of annoyance. She’d immediately spied that she could no longer scurry, unseen, out of the garage through the side opening of a creaky wooden tilt-up door. The new door ROLL-LIFTS up, exposing her to all sorts of visibility! Annabella is such a black cat! A week went by and she eventually accepted the new doors, though I suspect the attitude adjustment has more to do with the bliss of Gabrielle in her elevated grandeur, peering out of the garage windows, than with a genuine approval of this change of accommodation. 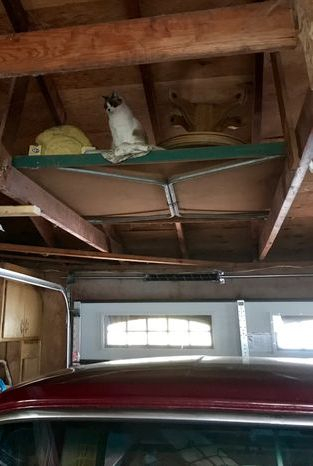 The truck throne, however, is a whopping step down from the customary contemplative perch of Gabby — atop her ping-pong table in the lofty rafters of the Garage Barn. With cats, change is always dicey! I would include a photo op of Annabella with this post, but until darkness creeps into the scene, and a damp chill falls upon her sleek black fur, she can’t be found! Even then, she seems to appear from out of Nowhere! My novel, THE POINT OF THE SWORD, features a little terrier called Terry. The name might seem redundant, but I hold a special affection for that name. You see, for quite a few years, six or seven, in fact, I was known by that name. It was not my intention to go from my given name, Debra, to Terry. I wasn’t even the one who changed the name. It was altered for reasons that still escape me. The moniker was given to me by a co-worker, a civil engineer whom I recall with quiet fondness because he was a quiet friend. I shall call him Mr. R.
I’d smile, “Hi,” and vanish into my office room. This interaction, along with some camaraderie, went on for the duration of time that I worked for the Federal engineering agency. Mr. R. would refer to me as “Terry” and I would go along with the name, almost pleased by it. Just as I was about to leave Federal service, however, he found out that my real name is Debra. He came to my desk and looked a bit embarrassed and very remorseful. He asked me why I didn’t correct him when he’d called me “Terry”. We both got a good laugh out of the missed understanding and the name confusion. Not that I want to be compared to a terrier, but when I first thought of a sweet name for the little dog that Sabine Mercier owns in THE POINT OF THE SWORD, the name TERRY popped up in my mind, almost like an affectionate terrier. 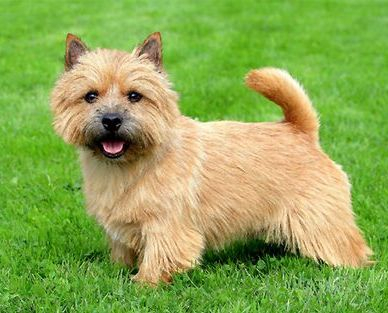 A Norwich terrier seemed appropriately 1920s American. I know that Mr. R. heartily and happily approves of the choice of breed and the name! 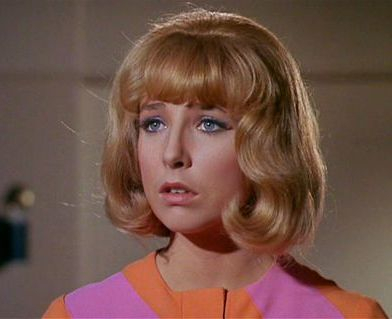 During this same time frame in my life, I was often, very often, told that I resemble “Teri Garr.” I even recall a neighbor woman originally from the Boston area who insisted that I was a double for “Teri Gahhhhh.” She also mentioned Chrissie Evert as an almost-twin, and so did several customers in the local coffee café (Café Canela, pre-Starbucks) who then began to call me “Chrissie”. I still don’t see much similarity, other than the blonde hair, with either of those two women. At that time, however, the name, Terry, was a big part of my life! 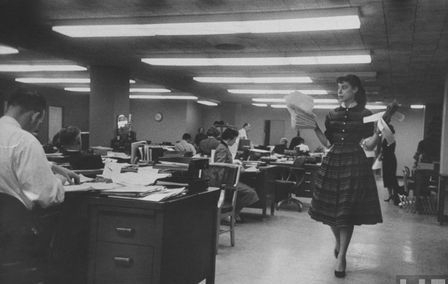 Perhaps Mr. R. thought that I was Teri Garr, walking the green-and-gray-checkered linoleum floor, down the hallway in that Federal Building. Come to think of it, he bore a mild resemblance to Leonard Nimoy, albeit with a neatly-trimmed beard. At least no one thought I looked like a terrier! 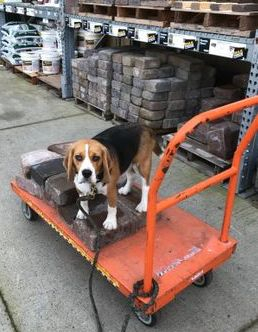 Home repairs and sprucing up the Homestead for sale have brought Chance to the local Home-Store often enough that the hound has become a celebrity. The employees and the customers almost expect Chance to arrive in the parking lot weekly, if not several times a week. One guy even explained that he was not following my husband, but the dog, into the store! It’s hard to stay humble with so much adoration. 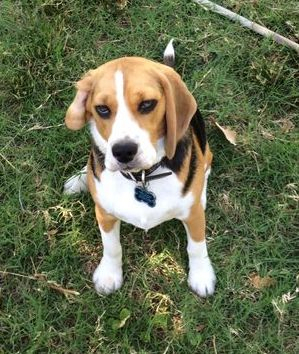 Dear Husband says that the chest of our beloved beagle has grown lately; it’s gotten very big, puffed up with pride. I think his head is keeping pace! I have vowed not to allow the Pets to overtake my website, especially the m-u-t-t. There are times, however, when I attempt to work on ye olde laptop and Chance decides that it is time for him to eat. The usual routine is for him to move on the laptop as if it is fresh kill, or prey of some sort. Eventually I am able to convince him that the dog food is in the bowl. He accepts the meal with the dignity of a hound, but not before trying to horn in on my work! 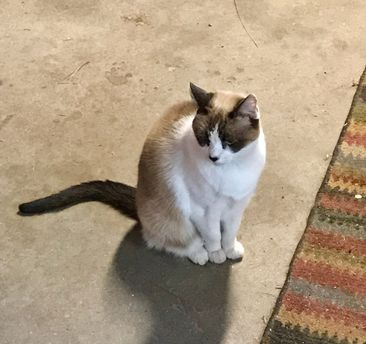 My two cats, Annabella the Burmese and Gabrielle the Snowshoe, are so happy in their new (rental) home that they look embarrassed. After 8 days in isolation in the garage (visited often by me to allay the low moans), Gabrielle let me know that she was ready for the great outdoors. I wasn’t so sure that the opening of the garage doors would not become the great escape, but I bravely opened the hatches to the front frontier! Slowly, gingerly, with wide-opened blue eyes, Gabrielle tip-toed out into a whole new world! Pine trees, rock outcroppings, oak trees, rocks, redwood trees, more big rocks, leafy trees, a wall of rocks, flowers (poppies, lavender, iris, coreopsis), another wall of rocks, a chunky gravel pathway, a long concrete driveway, — so many areas to explore and heights to climb! The house itself provides her with stairs to climb — to a front porch and a sunny back deck (on two levels). And then there are the hiding places — crawl spaces under the decks! I daresay Gabrielle has fully left the past abode behind her. Annabella, ever the black cat, was a different matter. She vanished through a duct opening in the garage wall and proceeded to crouch — calmly, silently, and casually — among the ductwork underneath the house — for 9 days! On day 2 of her Project Isolation, Dear Husband performed a subterranean reconnaissance mission (think cave) to assure me that the Black Cat had not used up all of her 9 lives. She was in fact quite pleased with herself: The Human had come to her! And she hoped that I was learning my lesson! Obviously, the Social Contract between me and my black cat was being updated. I was being taught a rather stern lesson, after plopping her into the pet carrier and whisking her permanently away from Home. On the other hand, or paw, every one needs cave time, and Annabella is no exception! One day after Gabrielle ventured forth into Natureland, Annabella followed in her q-tip paw-steps, as is usually the case. She scampered quickly and cautiously around all areas, searching for cover. She found it, above ground! This ultimate catbird also heard birds! The chirping and tweeting and cooing birdsongs (from 30 feet up in the canopy of the trees) keep Annabella transfixed with those big green eyes! She hides behind one set of rock outcroppings and believes that I do not know she is there. I always looked stunned to see her emerge from her hiding place. The cats are now so blissful that I am teaching them a lesson! I blocked that duct opening in the garage. And I am upstairs, in isolation, resting and recuperating from that labor of love known as helping cats settle into a New Home. 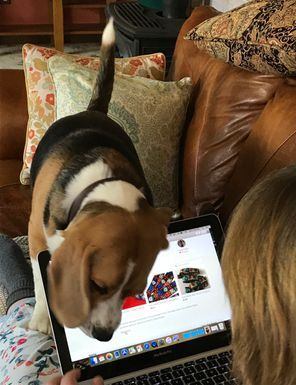 Chance the Beagle is busily keeping track, on several fronts, of the whereabouts of the cats. They all have new games to play. In a hound way, Chance is embarrassingly happy too.